The late night Great Northern trains lull me to sleep in my Finsbury Park pied a terre. As I eat my breakfast I watch the packed commuter trains from places like Letchworth and Welwyn Garden City, Hatfield and Stevenage New Town. This was not quite how it was meant to be. The idea was that the garden cities would be largely self sufficient model communities; they ostentatiously turned their backs on dirty, overcrowded and chaotic London positing an alternative idyll – the ordered and rationally planned town, the antithesis of a dormitory suburb. Grant Shapps, the almost likeable Minister for Housing and Local Government (well at least he has personally shown compassion for the homeless but WTF is he playing at with his social housing policies?) is also MP for Welwyn and Hatfield. He likes Welwyn Garden City so much he is championing the idea of a new generation of garden cities with the limp endorsement of posh boy Cameron, although of course that means little. 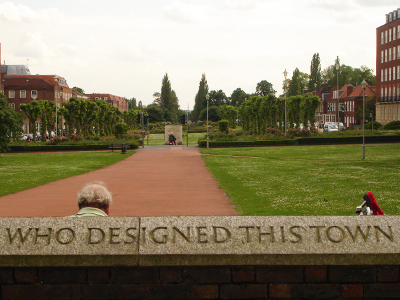 Garden Cities have never been short of supporters since Ebenezer Howard published his strange utopian vision in 1898. The Town and Country Planning Association has been banging on about them ever since (although I note their address is Carlton House Terrace). Currently the TCPA is promoting the redevelopment of Heathrow as garden cities, but this presupposes and effectively endorses Foster's mad Boris Island plan - thanks but definitely no thanks. 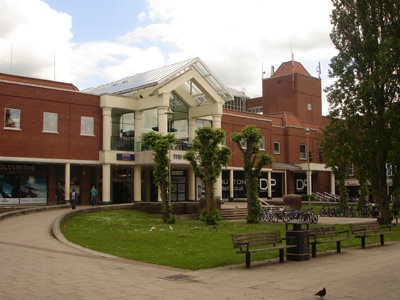 After the war new towns like Stevenage became a main plank of the state's housing policy with a second wave of larger new and expanded towns in the 70s. Then came the era of non-plan which has done so much to despoil our countryside over the last 30 years (just look at an old Ordnance Survey map) and yet managed to stoke up the current housing crisis. The reasons for the housing crisis are very clear and it is very clear what needs to be done – see Charles Holland's Fantastic Journal for the definitive account. What is also clear is that this will not happen because there is that very large problem of unthinking right wing dogma. Of course Tory planning ideology is hugely conflicted between what might be called the Ridley tendency and the interests of local constituents, but a 'niet' from the local golf club will always win, at least with Tory ministers. So Shappsy as Minister for Housing is caught in the trap of his own party's denial, his constituents' self interests, the incompetence of the banks and the failure of the volume builders to deliver acceptable and affordable new housing. 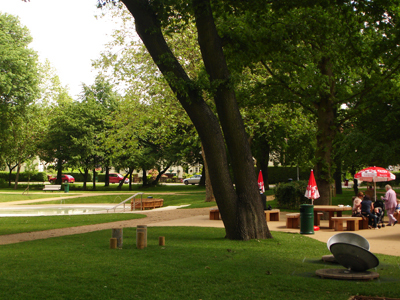 In this context promoting a new generation of garden cities makes political sense. 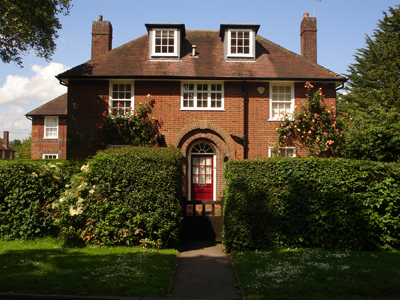 Conjure up a comfortable image of middle class domesticity; everyone will think of Hampstead Garden Suburb. Ersatz Arts and Crafts and pastiche neo-Georgian are not going to frighten the horses at Highgrove are they? So at least you get over the first conceptual hurdle, although this will not take you very far. Indeed Simon Jenkins will already be poisoning his pen to vilify the idea because we have conveniently forgotten the Green Belt, which in populist planning world trumps all other considerations. So, ok, put new homes on brownfield land like old air fields or military bases, abandoned mineral workings or mental hospitals; somewhere out of sight and not very pretty – that seems to be the idea. Does this all sound very familiar? Close your eyes and think of Ecotowns. But this was a Labour idea and therefore very bad. I seem to remember new settlements were very unpopular with the Tory leadership a few years ago and even more so with Tory councils – actually I know 'cos I was involved in planning one of 'em. Now Grant Shapps needs to repackage the Ecotown idea without the implied threat of wind turbines and with compulsory chintz. I have to be honest and say that I am not drawn to the garden city idyll. It all seems too tame, as Tom Dyckhoff quipped 'like a town laid out by your mum'. I actually like cities – where else can you go for fun? Well the countryside, yes, but what's good about the countryside is that it is just that. Ebenezer Howard's hybrid concept of garden cities providing 'the advantages of the most energetic and active town life with the beauty and delight of the country' seems entirely unconvincing. This is public provision - Howard Park, Letchworth. 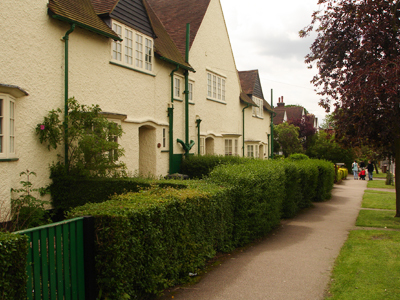 Letchworth was the very first garden city, begun in 1903. 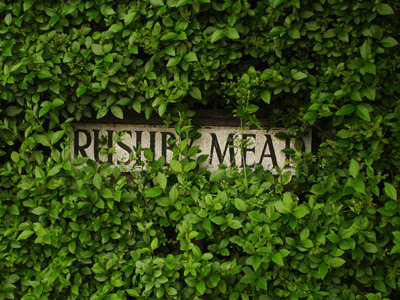 As you approach it at first it seems quite unremarkable, just like the suburbs of any town. 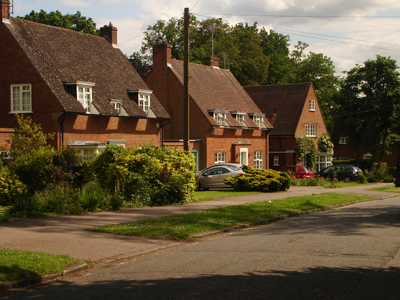 But that is because Letchworth was so very influential in shaping the suburban future of England. 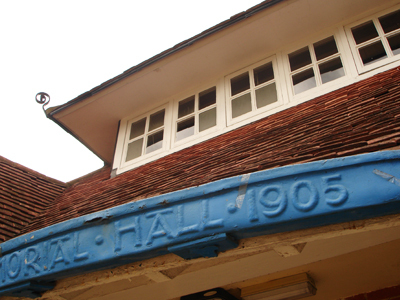 Its cottagey, vaguely Arts and Crafts, rough cast (because the bricks were poor) and prominent gables style launched garden suburb imitations throughout the land and a thousand inter-war Council estates. But Letchworth is a garden city, not a garden suburb although calling it a city is absurd; the town centre is entirely subservient to the suburbs, the inverse of a real city. However given the size of the town (33,000 inhabitants) the extent of public provision is remarkable. There is a lot of civic realm which it is very well maintained with no obvious issues of privatised space or officious security. The town centre is very quiet – no city bustle even though quite a lot of people are about. People drive sensible cars and the drivers are polite; traffic does not dominate. Socially it seems quite mixed, very different from say Surrey or Thames Valley towns; bling is nowhere in evidence. You could say it is quite old fashioned, like the image of a decent England before we realised it had been asset stripped and re-feudalised. So Letchworth looks back to an earlier England, not just in its romantic Arts and Crafts style but in the way it still manages to function as a quite civilised place, at least superficially. Public land ownership taming the supermarket giant. By train you arrive at the dinky neo-Jacobean station, sadly defaced by lurid signs threatening dire consequences if you do not buy the right ticket, or park your car for more than 2 minutes. The town centre plan is based on the rather leaden civic axis of Broadway. This is a wide street with a central promenade such as you might find in continental cities and it does work as quite a pleasant pedestrian space. Initially the street is lined with neo-Georgian commercial buildings of quirky interest, most amazingly the Broadway Hotel, only built in 1962 but very convincing. A Morrison's supermarket has been forced into this neo-Georgian habit and, altho' not very convincing, I'm sure it is a lot better than your local supermarket. At least it relates to the street and there is even quite a pleasant little square with a bust of Ebenezer Howard (who else). However on the other side of Broadway the enclosure is not maintained. Broadway's central promenade widens out into a huge green square around which are grouped various public buildings: town hall, schools, churches, library, new offices etc, none of which manage to make any impact or provide any visual coherence. Pevsner said 'the visual failure of Letchworth is that very square'. The quietly impressive neo–Georgian hipped roof town hall of 1935 suffers particularly from its precariously exposed situation between the huge green square to the south and a more urban square to the north, which is actually used as a car park. It reminded me of the vast and ill defined public squares of Aalto's Finnish new towns like Seinäjoki, which made me realise that, although a great architect, he was a poor town planner. It is depressing that Parker and Unwin's plodding formal town centre layout is clearly the inspiration, if that is the correct word, of all those endless masterplans for 'Sustainable Urban Extensions' that you see at design reviews. They seem to learn little from experience but evidently tick the planning boxes. Letchworth's founders were - let us say - eccentric. 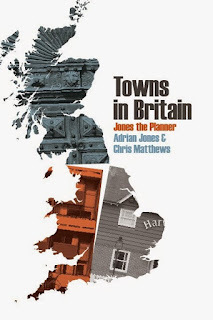 Jonathan Meades is the ideal person to explore this. But like other pioneer zealots (the Mormons for example) you have to admire their tenacity. Howard set up a company and attracted private philanthropic investors – you can see why Shappsy likes him. However the town was slow to develop and Parker and Unwin actually had little control over house designs. Arts and Crafts proved too expensive so had to be dumbed down for mass production so what we see, as Jonathan Meades says, is merely the mannerisms of Arts and Crafts. Nevertheless the early residential developments are undeniably attractive and clearly touched the English psyche. 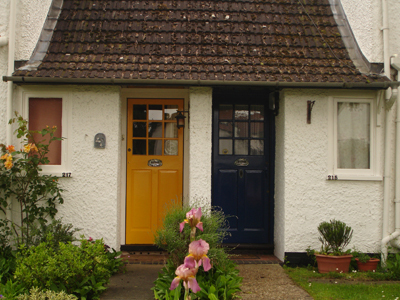 The houses built for the 'Cheap Cottages Exhibition' of 1905 are particularly interesting. Over 100 survive, most hiding their constructional innovation behind conventional detailing. 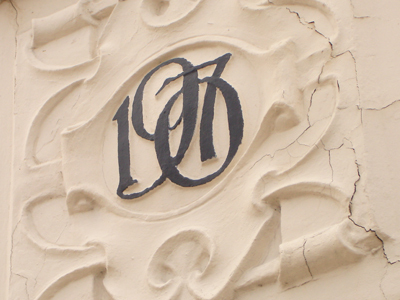 Many can be found in the streets immediately north of the station, identified with plaques. 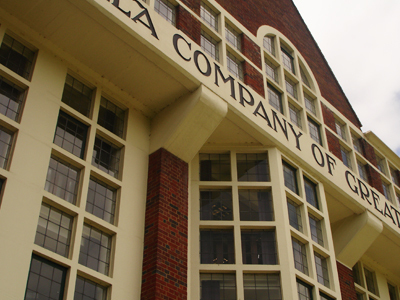 Industry was also slow to arrive but in 1912 work began on the Spirella corset factory, completed in 1920. This is an extraordinarily grand model factory with very Germanic looking heavy pavilions and proto-modernist glazed elements between, all set in parkland. It included unheard of facilities for the workers, including a ballroom. 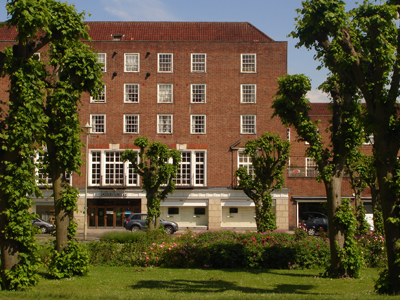 In 1995 the Letchworth Garden City Heritage Foundation restored it as a business complex. As in much else in Letchworth, this illustrates the importance of a central principle of garden cities - the public control of assets - which is not much in line with current neo-liberal orthodoxy. The original company set up by Howard became dysfunctional and in the 60s was replaced by a public Corporation. Fortunately this became the Heritage Foundation in 1995 before it could be flogged off to the private sector. 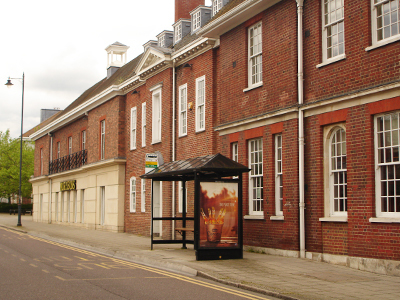 In many respects it is far more important to the future of Letchworth than the planning authority. Of course the quasi religious ethic of the garden city company had its downsides. Although big on churches – the Free Church designed in 1923 by Parker in the form of a Greek cross being rather fine – there was not much room for fun. 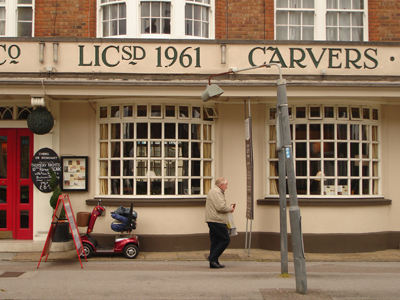 Until 1959 there was only one 'pub', the Settlement, which did not serve alcohol. Even today the 'leisure offer' is singularly limited. 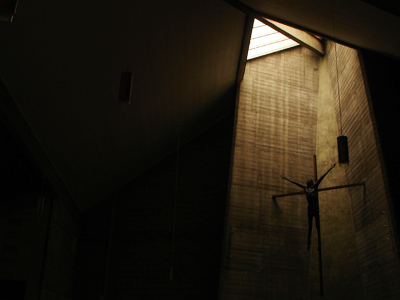 However a really good church has been added - St George at Norton, by Peter Bosanquet 1961, with a tall concrete spire formed of two sides of a triangle which penetrates the roof to provide the backdrop for the altar and a fine crucifixion above which are both flooded with light. Although Pevsner says the sweeping roof continues the vernacular tradition, for me the building with its strong influences of Corbusier is a welcome relief from Letchworth's rather stultifying version of Merrie England. Ok, lets admit it, we like Letchworth. Although we had not expected to like Letchworth, actually we rather did. But it does not stand up to rigorous analysis. What started as a social experiment has become a quintessentially conservative place and indeed the garden city concept was always inherently backward looking to a pre-industrial arcadia. 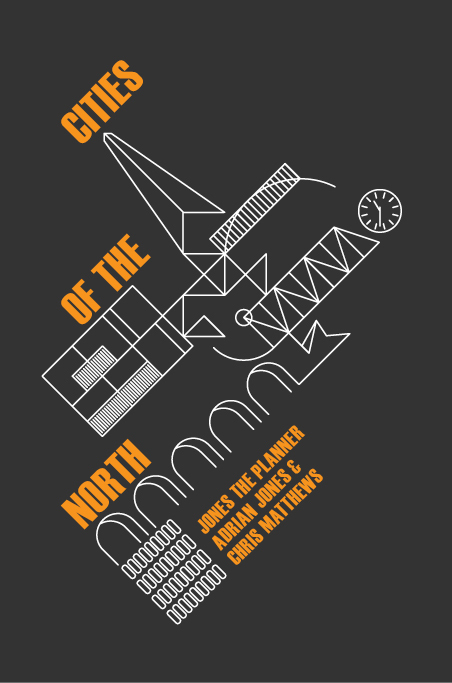 Both the founding visionaries and so many suburban residents today share fallacies about history, society and its expression in architecture which Jonathan Meades brilliantly characterises as 'False Memory Lane'. Nevertheless Letchworth is a comfortable place in an increasingly uncomfortable country and that is why people like it. 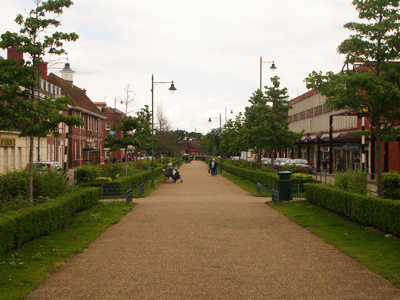 Welwyn Garden City is clearly a comfortable place too, but has a very different feel after Letchworth. Many people will have sped through Welwyn on the East Coast line and admired the stupendous viaduct over the broad Mimram valley, designed by Cubitt. The other great sight from the train is the stunning modernist Shredded Wheat factory near the station, with its expressive silos - totemic of a new age of optimism, rationality and healthy living. But actually this is a false impression of Welwyn Garden City. Far from representing modernity or the bucolic longings of Letchworth, its oppressively ubiquitous neo Georgian style conveys both social conformity and architectural complacency. 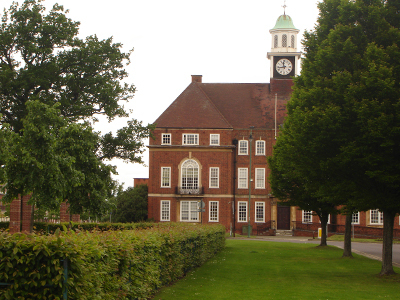 Welwyn Garden City was founded in 1920 as a private company under the guidance of Howard. The architects, Louis de Soissons and Kenyon, were more purposeful and less cranky than Parker and Unwin and the town developed more quickly. The layout and style of the town centre feels distinctly authoritarian, like a company town; there is no room for stylistic dissent. 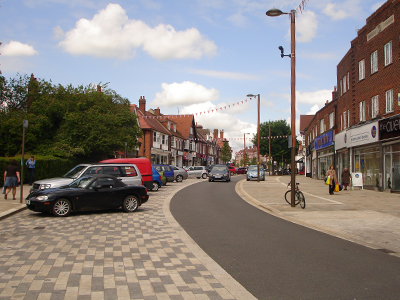 Welwyn, as Letchworth, is planned around a wide formal axis, Parkway, which provides a fine vista of parkland. 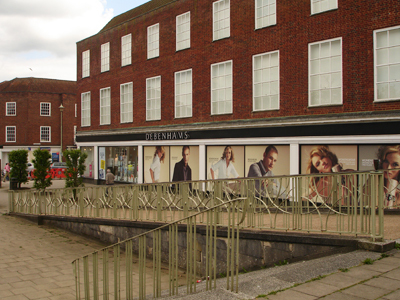 But as in Letchworth this actually serves as a barrier rather than a unifying element of the town centre. Howardsgate is a second wide axis linking the Station to Parkway. The endless repetition of minimally expressed neo-Georgian for the quite large scale commercial buildings is relentless. This is especially so for the massive Company department store designed by de Soissons in 1938, a leviathan that haughtily displays the thinnest approximation of a portico you have ever seen. This faces the meek 1935 Council buildings opposite - quite a nice exposition of relative power. The Company store is now inevitably John Lewis and apparently the best thing about WGC is their coffee shop scones, according to 'Let's move to' in Guardian Weekend. Says it all really. Welcome to Welwyn Station? Not really. Unlike quirky Letchworth, the shopping offer in WGC is very standard. The insultingly named Howard Centre, built in the 80s, is typically awful but especially hateful as it has subsumed the Station; what should be a key civic piece of the town is now lost on the upper shopping level and good luck finding it. In its smaller way this is as bad as Birmingham New Street. The most adventurous development we found was the Sainsburys, which sports a green wall (not doing too well) although even this gives in to dull as ditchwater neo-Georgian on the (dead) Parkway elevation. Across the very pleasant Parkway gardens is St Francis church. Wow! this is Georgian Gothic, not neo-Georgian. We get quite excited by the expressive brickwork but it is sadly disappointing inside. The architect – you guessed – is Louis de Soissons. A memorial to a planner - in England. There's something in that. The vista along Parkway ends with The Crescent – a formal semi circular park isolated by a swirling one way system. Around this are concentrated the various public buildings of Welwyn but like Letchworth they entirely fail to create a civic ensemble or to terminate the view along Parkway. Next to the overwhelmed Council offices is Oaklands College with its pleasant unassuming Scando-modern original campus buildings. The opposite quadrant is occupied by Campus West, an angular hard red brick complex from 1973 by Sheppard Robson. 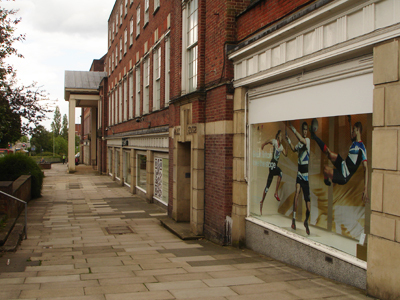 It includes a library, theatre, cinema, art galleries and 'Roller City'. The original rather impressive entrance now serves only the library, currently closed for refurbishment. You enter the other venues from the car park, which is a pity as the new entrance totally lacks presence and as a cultural hub Campus West lacks buzz. However at least it has some sculptural interest and the self confidence to stand out in a conformist town. 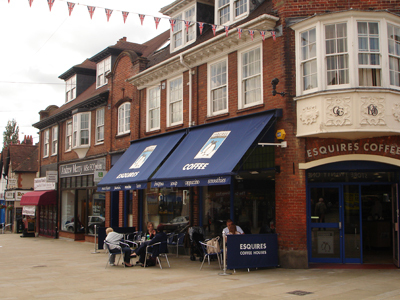 The thing about the commercial neo-Georgian of WGC town centre is that it is so bloodless, so lacking in conviction, so loveless in inspiration. This is not true of the suburbs where neo-Georgian finds more natural and individual expression. The early houses along Guessens Road for example, including de Soissons's own residence, are extremely well conceived and detailed – very des res indeed. The leafy residential roads quickly shake off the rigid axial plan and meander pleasantly, apparently laid out this way so as to preserve the original trees. Less grand cottagey houses are often grouped informally around leafy greens and quite convincingly evoke their rural inspirations. 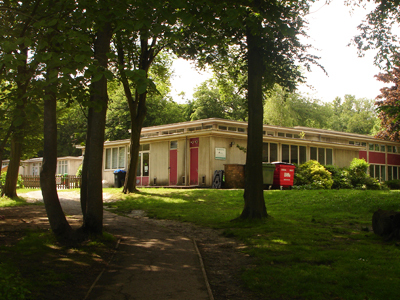 The area towards Sherrardspark Wood was built in the 50s and the plan is very well handled. The houses still have muted Georgian allusions although a few are toying with modernism. 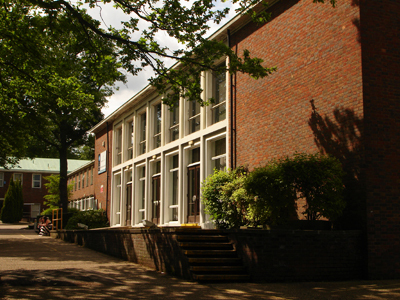 Here you will find Templewood School, according to Pevsner one of the best of Hertfordshire's renowned programme of post war school building. What is difficult to understand about Welwyn Garden City is why the town centre is so prim and tentative and yet the industrial area across the tracks so excitingly of its time. The huge Shredded Wheat factory, like something in Metropolis, was (amazingly) designed by Louis de Soissons. 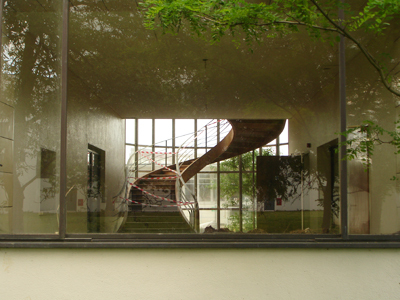 The Roche factory of 1938, white and unadorned, is the purest Modernism designed by the Swiss Otto Salvisberg. 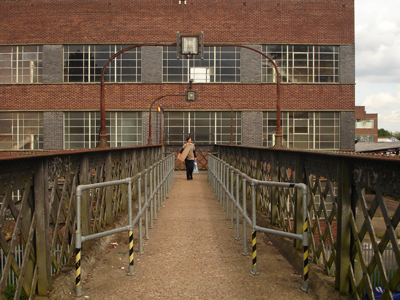 Pevsner certainly approved: 'the factories at WGC show how from the 20s the best industrial architecture, inspired by continental example, was developing a new confidence and originality.' Both are listed and sadly both redundant. 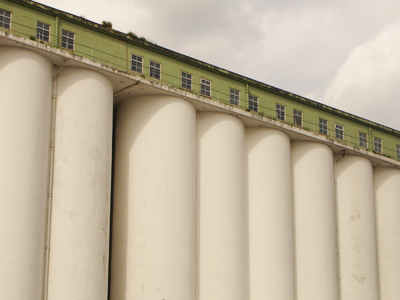 Tesco's plans for a redevelopment of the Shredded Wheat factory, which to be fair would have retained the listed original factory and those amazing silos, has recently been refused planning permission. The redundant site now awaits its fate ominously guarded by CPUK, following the posting of some great pictures of the empty structure by urban explorers. The original Roche factory, also listed, sits empty waiting for a new use whilst all around it Taylor Wimpy build what are actually not bad new houses and flats. They clearly pay some regard to the inspiration of the Roche building and in a sense to the stripped neo-Georgian tradition of the town; we have seen a lot worse. A chirpy chap from Taylor Wimpy said if I liked the Roche building so much I could have it for £1million. Bargain – but why has this not been sorted out as part of the planning permission? It is easy to see why Welwyn and Letchworth are so popular. They are clearly good places to live; plenty of facilities, nice house and surrounded by countryside. You can live a life of quiet domestic content here, insulated from the troubles of the big city. But their success relies little on the founding utopian visions and rather more on them anticipating the low density suburb and the economy of decentralisation. 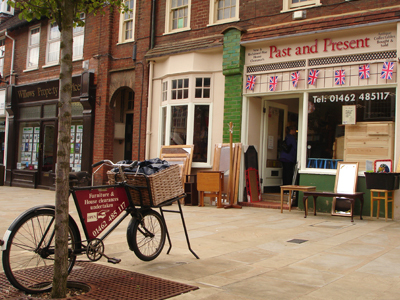 Far from being self sufficient neo-rural communities they are part of the polycentric metropolis of Hertfordshire with 10 or more very substantial towns, as diverse as St Albans and Stevenage as well as Letchworth and Welwyn Garden City. This metropolis is set in very attractive and jealously guarded countryside but it is an urban phenomenon, not a rural society, with a population of over 1 million people. All the towns are real places not just dormitory suburbs but at the same time they depend on the connection with the capital and are very much part of London's economy. The planning profession has a strong emotional attachment to the garden city movement but I would argue this is misplaced. The objectives of social harmony, working class improvement and self sufficiency which Howard sought to achieve are not going to be realised by promoting more low density suburbs on ex military or industrial kit, which will in reality be isolated exurbs – let us call things by their real name. In fact this will exacerbate the problems of social segregation and deflect from action to tackle the multifaceted problems of cities. The Ecotown concept was an honest, if flawed, attempt to explore new ways of providing housing and pushing forward the sustainability agenda.This government is turning its back on sustainability and urban problems. More socially regressive even than Thatcher, it is cynically promoting garden cities because it hopes an Arts and Crafts or neo-Georgian makeover will mean bog standard exurban housing is easier for developers to push through against the wishes of existing communities, which Localism has actually further empowered. Dream on Shappsy. Our next blog will look at the new towns of Hertfordshire and in particular examine the dilemmas of planned expansion in Pickles world. This is really organized and it’s obvious you have done the necessary research! Good job! Excellent blog. I've never been to either Letchworth or Welwyn, but now I've got a flavour of both. Thanks. Great article - I feel a trip to Letchworth coming on. Can I add a mention for the often overlooked Progress Estate in Eltham..